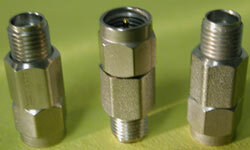 JFW Industries now offers a new DC to 6 GHz low-cost SMA fixed attenuator. JFW Industries now offers a new DC to 6 GHz low-cost SMA fixed attenuator. This miniature HEX body device offers excellent VSWR, good attenuation accuracy, and a wide operating temperature range of -65 to + 125 degrees C. Capable of handling 2 W average power, this unit is ideal for multiple applications ranging from wireless installations through to laboratory test requirements. Buy this product online at JFW's e-commerce site.